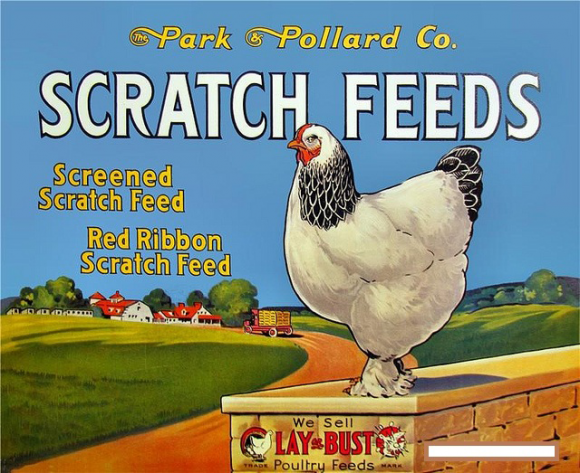 This is a rectangular Park & Pollard Scratch Feed porcelain sign. This particular Park & Pollard Scratch Feed sign is very colorful. It reads, “The Park & Pollard Co. Scratch Feeds, Screened Scratch Feed, Red Ribbon Scratch Feed, We Sell Lay or Bust Poultry Feeds, Trade Mark” and features a white hen agrainst green rolling fields and red barns.